This is a common type of every day home cooking without a classic name. Nothing exotic just yummy good food. Fried the tofu with some oil till lightly brown all sides, leave to cool and cut into bite size. Fried the fish till brown (not necesarily cooked through), take out and leave aside. In the same pan with a bit a oil, fry the garlic, ginger, onion and half the chillies till softened and fragrant. 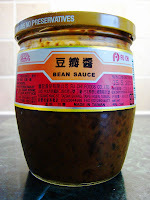 Add in the yellow bean sauce, stir for about 1 minute. Add in 1 cup of water, add in oyster sauce, vinegar and ketchup. Taste to see if you like to add a bit of sugar to balance the taste. Bring the sauce to boil. Add in the fish and tofu pieces, cover and braised till the tofu and fish for about 10 - 12 minutes till bubbly hot. Drizzle in cornflour water and stir gently to thicken, add sesame oil. Add in 3/4 of the spring onion and coriander, stir and heat off. Ready to dish. Sprinkle on remaining chillies and herb on top. * If you buy pre-fried tofu that will save you some time. Just cut up into small pieces. Can also use puffy tofu if you like. 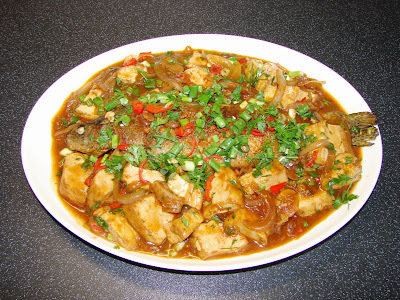 If you don't have or don't like tofu, you can use a 2 - 3 sweet pepper, sliced and any colour you like.